Microsoft desperate efforts to stamp out QuickTime helped to line up a series of events that positioned a deadly weapon and pulled its trigger. The problem for Microsoft was that it had mistakenly aimed the gun at its own weak spot; the bullet has been tearing through layers of Microsoft ever since. Here's what went wrong. Towards the end of 1991, Microsoft released Multimedia Extensions for Windows 3.0 to provide support for standard sound cards and CD-ROM players. Microsoft also worked with Creative, Dell, and Gateway to push a new hardware standard called the Multimedia PC. MPC hoped to challenge the position of Apple's Macintosh by defining a minimum set of hardware standards that would limit the headaches of supporting the wide range of quality and component variety found in PCs. Since Apple designed its own hardware, it had a much easier time delivering new software advances. The MPC designation was also intended to push DOS users to adopt Windows, and to get developers to support the new environment. While Windows had actually existed as a product since 1985, nobody had bought it prior to 1990's version 3.0, nor had PC manufacturers pre-installed in on any of their machines. At the same time that Microsoft was using the term “multimedia” to refer to basic audio support on PCs, Apple was releasing its new QuickTime architecture for synchronized audio and video playback. Apple was able to maintain such a dramatic lead in software innovation in part because it only had to support the hardware from one vendor: itself. Apple's hardware was not only more consistent, but it was of higher quality. Mainstream Macs were being sold to a high end audience of graphic designers; the only entry-level Macs were older models that had been recycled to sell to the consumer market. That left Apple with a profitable but vertical market, and left the door open for Microsoft to expand around it horizontally with a cheaper product that delivered a good enough alternative to fit the majority of needs of the majority of the market. While Microsoft gained on its goal to own a wide market, Apple focused on developing technologies that would keep it ahead of and distinguished from mass market competitors. QuickTime was a key aspect of that strategy. That intent was reflected when Apple ported QuickTime to Windows: it initially only supported playback, ensuring that Macs would retain the role of authoring multimedia content consumed by the wider PC audience. Macs similarly led PCs in print and graphic design, and authoring content for the web. As Windows gained ground however, it became increasingly difficult for Apple to maintain its technical lead and its ownership of the authoring market. One significant reason for this related to third party developers. Apple needed authoring applications to take advantage of QuickTime; without any, it would have become as irrelevant as PowerTalk. Just as Adobe's PostScript technology had been applied by Aldus PageMaker to create the desktop publishing industry, QuickTime needed pioneering applications to really take advantage of its abilities. Applying raw technology was such a key part of Apple's plans that the company had coined the term “application” to use in place of the words program or executable. One of the first applications for QuickTime was Adobe's Premiere, a non-linear editor which launched at the same time as QuickTime. Non-linear refers to systems that edit video on disk, rather than editing video tape or film. Aldus also released its own QuickTime-based editor called Hitchcock, as well as AfterEffects, a motion graphics application used to render layers of video, graphics, and effects. The weaker, duplicative remnants of the Adobe/Aldus merger were dropped, apart from FreeHand, which ended up being licensed to Macromedia to preserve competition between it and Adobe's Illustrator. The merger also gave Adobe a set of QuickTime-based video applications: Premiere and AfterEffects. Adobe treated them as secondary efforts; both served much smaller markets than the enormous print production industry, particularly at a time when video work demanded fantastically expensive hardware. High-end video work was typically done using $150,000 workstations from Avid, using specialized hardware for video capture, compression, and playback. As a QuickTime-based software tool, Premiere had a limited audience. The multimedia market envisioned by QuickTime had not turned out to be anything close to the desktop publishing revolution of the 80s; the technology simply wasn't available yet. QuickTime was stuck creating interactive CD-ROMs and serving as a medium for video clips without much of a business model. As Apple's future prospects began to look increasingly bleak between 1994-1996, Adobe focused on its print production tools, and worked to deliver them cross-platform on both the Mac--its existing business--and Windows--which appeared to be where all the growth would come from. Because it sold moderately expensive print production software, Adobe continued to make more than half of its revenues from Mac users. This precluded it from developing a Windows version first and then back-porting it to the Mac later. Instead, Adobe created its own internal development system that allowed it to work on a single code base for each application, then port the result to run on both the Mac and Windows. This custom development system kept the features of both versions in sync, and made them easier to support. The downside to Adobe's custom cross-platform development system was that it made it difficult or impossible to incorporate support for new, unique features Apple developed to differentiate the Mac platform, including QuickDraw GX, QuickDraw 3D, PowerTalk, OpenDoc and other huge projects Apple had begun only to find minimal interest for among its developers. Adobe’s custom development system was also a significant reason why the company would not support Apple’s entirely new Rhapsody platform: it was simply too different for Adobe’s internal system to accommodate. Other third party developers had similar needs to target cross-platform development. Apple’s efforts to introduce “innovation” were increasingly in direct conflict with the needs of its developers, the same people Apple depended upon to support its Mac platform. The company appeared to be in a no-win situation. QuickTime stands in contrast to a series of Apple's other mid-90's development failures; part of the reason for its success was that Apple eventually ported authoring support to Windows. While that encouraged developers to use QuickTime as the basis for their applications, it also erased QuickTime as a differentiating reason to buy a Mac. As Adobe's interest in maintaining Premiere began to wane, Apple worked to find other developers interested in delivering QuickTime applications. In 1996, Apple began work with Avid on a QuickTime-based, consumer video editor tool called Avid Cinema. A few months before, in 1995, Randy Ubillos and other members of the Premiere team at Adobe left to work for Macromedia. At the time, Macromedia's core business was selling Director, an authoring tool used to create multimedia presentations. Director was deeply integrated with QuickTime, so hiring away Adobe's Premiere group seemed like a good way to develop Macromedia's business into the realm of digital video. Ubillos and his team wanted to deliver a new, professional level video editor based on QuickTime that went beyond what Adobe had in mind for Premiere. The new app was called KeyGrip, and was first previewed at the National Association of Broadcasters event in 1996. Macromedia later renamed it as Final Cut. According to a monopoly case deposition of Apple's Phil Schiller, Macromedia “had a strategy of using Apple's QuickTime as the engine and API for video editing on the Mac and a technology from Microsoft called ActiveMovie on Windows. In addition to failing to deliver its announced competition to QuickTime--and then abandoning its own ActiveMovie entirely--Microsoft also worked to block the use of QuickTime by third party developers, starting with the largest: Avid. Avid had been partnered with Apple since its founding. The company demonstrated its first video workstation built around a Mac II at NAB in 1988, and a large portion of Avid's installed base were using Macs ten years later. Microsoft was so intent to kill QuickTime that it pressured Avid to drop its Mac support entirely. Microsoft had deepened its involvement with Avid in a 1998 deal that resulted in Microsoft owning 9.1% stake in the company. That deal itself was rife with scandal and drama, which started four years earlier when Microsoft bought a Canadian special effects software company called Softimage in 1994. Softimage developed software tools for Silicon Graphics workstations; Microsoft bought the company to slaughter SGI and replace the movie industry's SGI render farms with PCs running Windows NT. After porting Softimage to Windows, Microsoft had little use for the company, and sold it to Avid for cash and stock in 1998. In between, Microsoft managed mix in stolen code from a smaller developer into Softimage's tools; that company went into bankruptcy trying to sue Microsoft for the code theft, and was only able to win years later in 2001, when a French court found Microsoft guilty of software piracy and ordered it to pay $425,000. Courts upheld the case again in 2003. Leveraging its new ownership in Avid, Microsoft could now pressure the company to drop support for the Mac. Microsoft first demanded that Avid stop using QuickTime in Avid Cinema, telling it “You need to rip QuickTime out of your product if you want to be in this channel,” referring to the channel for direct sales in Windows 98. Microsoft then pushed Avid to join it in announcing exclusive support for its new Advanced Authoring Format at the 1998 NAB, positioning Avid as a direct competitor to its long time partner Apple, and deleting QuickTime from the business plan of high-end leader of the video editing market. In addition to the wholesale abandonment of Apple by Avid, Adobe was also working to reduce its dependance upon QuickTime in Premiere. Fearing that Apple would not outlive its troubles, Adobe developed its own hardware abstraction support rather than using QuickTime's. Premiere 5, released after Ubillos and his team left for Macromedia, offered a modest upgrade but was also slower and less stable. Adobe’s newly QuickTime-independent hardware abstraction resulted in video capture crashing frequently. 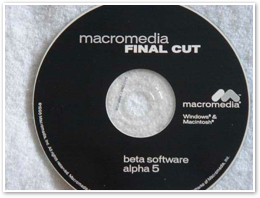 The last hope for a strong QuickTime application partner remained with Macromedia's Final Cut, but by 1998, Macromedia was no longer very interested in the video editing market. Two years earlier, it had purchased Future Splash Animator, a tool for distributing vector based presentations on PDAs. Macromedia renamed it Flash, and marketed it as an essential tool for making the web proprietary. Along with its acquisition of what would become Dreamweaver, Macromedia now saw itself only as a web tools vendor. As a result, Macromedia slashed the development budget for Final Cut. At the 1998 NAB, Ubillos and his team had to demonstrate Final Cut in a private showing, because Macromedia dropped its exhibit on the main show floor. If hope for Final Cut's survival weren't already shaky enough, Microsoft also got involved there, too. It had signed an investment deal with Truevision that prevented the company from developing QuickTime drivers for its video capture cards for use on Windows. The Final Cut team had been working closely with Truevision, so that new interference helped to strangle any potential for Macromedia to ship Final Cut cross-platform, which in turn made it unlikely to ship at all... at least for Macromedia. •Many Yaks were exploited during the creation of this product. •Where's a single Yak to go now that the Edit Bar is gone? •You can call me Bruce the Wonder Yak. •The Yak is a delightful creature... rather like a bovine Confucius. 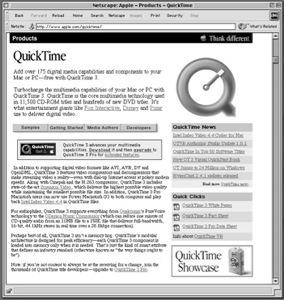 Countering the bad news for QuickTime at NAB 1998 was the release of QuickTime 3.0, the first major new revision since NeXT had taken over the company. Reporting on the event, Bob Doyle of SMPTE/New England wrote, “Apple released QuickTime 3 as a full-fledged authoring tool on Windows, confounding a few skeptics who thought Jobs might cancel a Windows authoring version at the last minute (QT 2.5 for Windows was play only), just as he had pulled the plug on Apple clones. After bringing QuickTime fully cross-platform, Apple knew Microsoft would act on its earlier promise to expend all resources necessary to destroy QuickTime and polarize the industry against Apple using the new Advanced Authoring Format. Microsoft thought that its new AAF would simply take over the film editing industry; it submitted it to the SMPTE standards organization for broadcasting, just as it had earlier submitted its new ASF container format for Windows Media to the ISO for use in MPEG-4. After the ISO rejected ASF in favor of QuickTime's MOV container, Microsoft retooled its AAF efforts to suggest that AAF was not just its own proprietary standard. In press releases, Microsoft listed Avid, Adobe, Softimage and Truevision as AAF's task force, along with Matrox, Pinnacle (now part of Avid), and Sonic Foundry. One of the significant problems for AAF was that it came from a marketing company known for delivering a “technology vision of the month,” rather than a technology company working to build real products. Doyle cited Video for Windows and ActiveMovie, after which “an industry consortium similar in makeup to the AAF group designed OpenDML, which was partially realized in Active Movie 2 (sometimes called AVI-2). However, the all-important hardware abstraction layer was never built (or approved) by Microsoft (who was then more interested in distribution than content creation), so companies like Avid, D-Vision, and in:sync had to build their own hardware-specific drivers (with the critical help of Truevision and later Matrox) to stay alive in the Windows editing business. “During the same years over at a beleaguered Apple,” Doyle wrote, “the QuickTime team stayed intact and pressed its hardware abstraction advantage. They did not ignore Microsoft and Avid developments, even adding OpenDML and OMFI support (read-only of the M-JPEG media) to QuickTime. “Just as the Mac OS can read PC disks and open Windows files, QuickTime editors can read files built on PCs and sent over Windows networks, including the original Video for Windows and AVI-2. 'OpenDML is history,' said Microsoft. 'QuickTime will read OpenDML to protect legacy investments,' says Apple. “If we take a wildly speculative look at future NABs, we can already see that Microsoft will have to replace AAF at NAB '99 and of course NAB 2000. Not that AAF will be completed, just that it will be superseded because it did not allow metadata to travel to the end user [...] does Microsoft and [its] developers have a clue? Shortly after the NAB event, Apple began talks with Macromedia to buy Final Cut and hire its engineers. At the 1999 NAB, Apple introduced it as Final Cut Pro, with support for DV and Firewire, bundled on the Power Mac G3. The new product served as a low cost demonstration of the power of QuickTime, offering to do a lot of the work that previously required access to an expensive Avid studio. By the end of 1999, Apple had also released QuickTime 4.0--which added support for Internet streaming using standard, open protocols and even offered its QuickTime Streaming Server as an open source project. In addition, Apple released a new consumer level video editing app built by the QuickTime team: iMovie. The company had discovered that if it wanted to have apps for its Mac platform, it needed to develop them itself. The result was a series of acquisitions and new projects which resulted in the iLife consumer suite of applications, a series of Pro Apps, and a range of prosumer applications in between. QuickTime plays a major roll in every one. Apple was still developing its applications for the classic Mac OS; the new Mac OS X didn't ship until 2001, and wasn't really ready until Jaguar in 2002. 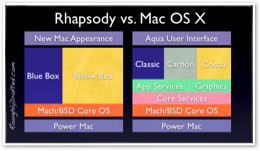 The 1997 Rhapsody transition plan had been rejected by the large third party developers including Adobe, Microsoft, and Macromedia, forcing Apple back to the drawing board to redefine how it would introduce its NeXT operating system to Mac users. QuickTime played a significant role in making this happen as well. Apple's port of QuickTime for Windows had incorporated a lot of QuickDraw and other Mac System 7 libraries to allow Apple the ability to run QuickTime on its own foundation, rather than trying to interface with Window's initially primitive--and then constantly changing--drawing and sound software libraries. 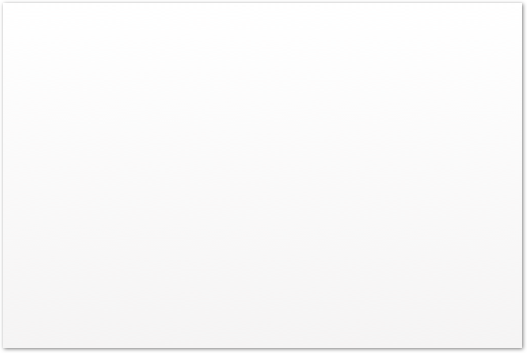 As Apple began porting QuickTime to Rhapsody, it discovered that--since much of the classic Mac OS was already encapsulated in a portable wrapper--it could be used as a basis for delivering a cleaned up version of the classic Mac APIs inside of NeXTSTEP. 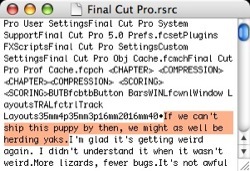 As an engineer at Macromedia described in an email, “one of the QuickTime engineers reportedly used this underlying code to port the venerable SimpleText to the new operating system (presumably with very few changes to the TextEdit code). He showed this to his boss and the project that was to become Carbon was born. Apple's work to aggressively build upon QuickTime and compete in the market against Microsoft--rather than just handing its technology over and “partnering” with the company--launched Apple ahead and established major new markets for the Mac platform. Final Cut Pro initially established the Mac as an essential tool among editors for their secondary work, and then quickly progressed into direct competition with Avid, forcing the one-time leader in non-linear editing to dramatically lower its prices. Avid--and other companies seeking refuge in Microsoft's shadow--found that just because the company has huge amounts of cash does not mean that it knows what it's doing, or that it will or can deliver upon its plans. Despite making brutal deals within the entertainment industry, Microsoft has had a limited impact on how things work. Without being forced into place by a monopoly, Windows Media and AAF were barely able to compete on their own merits. Meanwhile, Apple's success with Final Cut Pro on the Mac encouraged Adobe and Macromedia to continue supporting the platform with their print and web tools, maintaining Apple's position in authoring. Final Cut Pro made quick work of the remains of Adobe Premiere on the Mac, and Adobe later released a new Windows-only version called Premiere Pro. However, since so many film editors now use Apple gear, Adobe decided to deliver Premiere Pro on the Mac as well. High-end equipment sales related to Final Cut Pro boosted profits and helped to drive innovation in Apple’s hardware and software, but the real growth for Apple would come from a revitalized consumer focus. 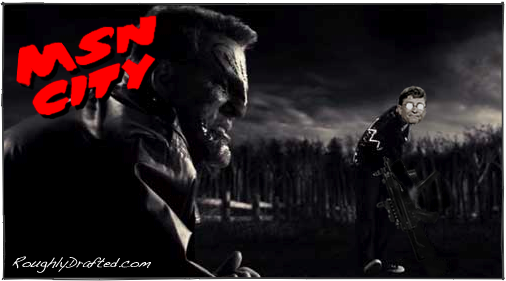 A future article takes a look at how.